I remember distinctly the night I first heard of Ulpotha. It was July 1998 and I was on a hotel rooftop taking in the sunset, silhouetted palms, jangling temples and urban thrum of Mysore, India, during a month-long yoga holiday. 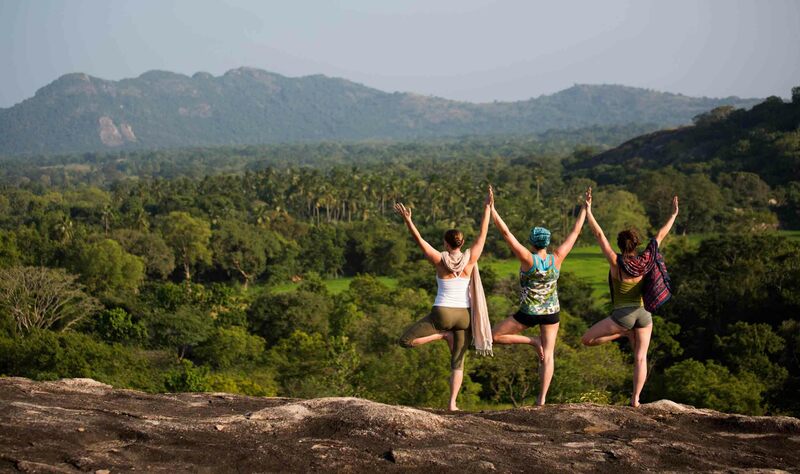 A handsome stranger told me of a magical, lake-fringed place high in the hills of Sri Lanka that, for a few months a year, opened to a handful of yoga holiday-makers. I vowed I would get there. Years later, I arrived in Colombo and sat jet-lagged and wide-eyed as our Jeep snaked past the dawn beachfront and deep into the heart of Sri Lanka’s jungled hills. And then we arrived at Ulpotha and the lush, ecological, electricity-free community that would be my home for two weeks. There were tree houses where you could sleep in white-sheet simplicity high in the palms. ‘I went home eased, soothed and inspired by the beautiful setting. There was a little cabin over the lotus lake where you could lie in bed listening to the creaks and whispers of the fauna. There was a shower “room” where you stood, enclosed in an outdoor palm grove, turning a cleverly fashioned bamboo handle to release the freshest water from above. The main meeting and eating point, the Ambalama, was a Balinese-style open building with generous, colourful cushions and delicious home-made food – mouthwatering coconut pancakes and morsels of lightly spiced potatoes and chickpeas. The Ayurvedic healing centre had smoking wicker baskets, massage rooms and steam treatments. Before the yoga session on my first afternoon, I unwound in my “room”, a spacious open-plan hut with no walls but cleverly designed palm-frond shading to ensure privacy from human and animal eyes. An elegant bedhead presiding over a floating canopy of mosquito netting doubled as a storage area for my clothes. The yoga took place on a graciously canopied open-plan floor, set among the greenery. Sympathetic about our jet lag, our teacher took it easy at first. The type of yoga here changes every two weeks and our group was on an Ashtanga Vinyasa retreat, which promised an intense series of yoga sequences. Everyone in the group had done yoga before but the levels – as so often on such holidays – were varied. Stiff from the plane, and with 15 years of yoga behind me, I knew I should be gentle with myself. As the first week flowed, the yoga became more challenging: sequence after sequence in the heat, stretching and contracting time and time again; hovering almost supine above the floor; balancing only on my palms and the toes on one foot, the other foot, as instructed, shooting skywards; my mind losing sense of what my body was doing, surrendering what I thought I had been capable of previously; finding my breath, surpassing old limits. Towards week two, as my muscles surrendered, internal cobwebs were swept away and along came the customary yoga-retreat “stuff”. I’ve learnt there’s a regular trajectory to a yoga retreat: de-stressing at the start, settling in, getting a bit antsy mid-way and surrendering to all that peace-love-and-happiness just as you are about to depart. My “stuff” manifested itself as a very itchy, angry rash. I went for cooling swims in the lotus lake; I sought refuge in the Aryuvedic cupboard sitting on a wicker grill over special smoking herbs; I took homoeopathy. My yoga got stronger, and so did my rash. It got angrier and pricklier. Finally, someone gave me some good old-fashioned antihistamine cream. The cream – and four hours of yoga a day – worked their magic. I was released, my body supple, strong and calm. Marvellous. I danced and danced at a party by the shores of the lake, free of all discomfort, celebrating a renewed and flexible body. When not being massaged with oil dripping on my forehead, reading by the lake, swimming or bicycling, I found time to forge a new friendship with someone who has remained one of my closest friends. And the handsome stranger, now not so strange, who just happened to be working there during my stay, has just asked me to be godmother to his first son. I went home eased, soothed and inspired by the beautiful setting, the ethos of the place, the people I met and the yoga I practised there. I still practise that form to this day. Ulpotha changed my life.